There were two essential pieces of intelligence about the media economy unveiled during WPP’s quarterly presentation to investors Thursday. You can find them on pages 39 and 43 if you want to download the 130-page deck, but we’ll give you the gist here. The first one provides some insight about why the ad industry’s expansion has been lagging the growth of the overall economy. The second one explains how digital ad spending is accelerating an expansion of the global e-commerce marketplace. With the exception of 2016, when advertising matched economic growth, the ad industry’s expansion has been lagging the global economy by about one percentage point, according to data presented by GroupM Futures Director Adam Smith. 1 - The industry is doing a poor job of measuring growth in developing nations that account for much of advertising’s expansion. He said this could represent as much as $10 billion of missing ad spending in industry estimates. 2 - Digital budgets historically would have gone into “working media,” have instead been diverted into “technical expenditures” -- technology used to process digital media buys, which account of about 19% of digital display and about 2% of paid search. He estimated that accounts for about $20 billion of advertising’s under-measurement. 3 - Lastly, and by far the most concerning, Smith said the balance is accounted for by the “compression of traditional advertising” and by brands diverting advertising budgets into promotional spending. As disruptive as digital advertising’s expansion has been for measuring the industry’s economic growth, Smith presented a fascinating analysis showing its efficiency for stimulating global commerce -- by a margin of two-to-one. 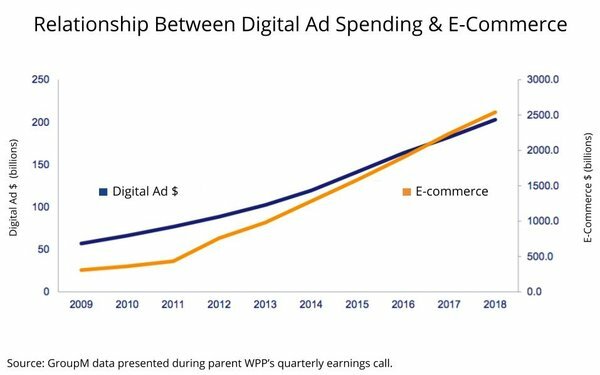 “Digital advertising is currently 8% of the volume of e-commerce,” Smith said, adding that GroupM’s current estimate is that will correlate to a 15% rise in e-commerce, bringing the global e-commerce market to $2.5 trillion in 2018, or about 10% of global retail sales. That translates into real money, Smith said, noting that the “average Internet retail shopper in 2018 will spend just under $1,000,” representing a 10% increase in spending over 2017. Here’s the important part of the correlation: Every 5% increase in Internet usage translates into a 10% increase in commerce. That happened in 2017 and Smith predicts it will happen again in 2018. The bad news for big global brands and traditional media, he noted, is that much of that growth is coming from newer, “webendemic” brands that are using the Internet to launch new products and services that are offered “direct” to consumers. “We have plenty of real-world evidence of nimble online challengers, flexitarians, picky Millennials, and delighting in the infinite shelf space of online,” Smith said, adding that there is some upside for traditional media outlets in these economics. 4 comments about "How Digital Ad Spending Accelerates E-Commerce Growth, Why That Is Good For 'Traditional' Media". Chris Peterson from R2C Group, March 2, 2018 at 11:55 a.m. Fantastic piece teasing out growth of ecommerce relative to overall ad spend. Love the GDP growth relative to ad spend - pretty much demonstrates the dawn of a new age. Thank you for posting. Couple of thoughts: Today ecommerce remains in the low teens as a precentage of total retail sales, but is growing faster than anything (only trillion dollar industry with double digit growth). So today this is still a bit of a small category, but it will plow through the landscape in an unrelenting fashion. The one thing I would point out here is that the "webendemic" companies, while certainly building a strong foundation using digital media, turn to TV next to drive scale. With that, they bring a digital mindset to TV, which is helping transform how TV gets done. The problem I see with the large global ad networks is that they aren't as in tune with this because of these newer brands generally are not inclined to work with a big network agency. When Martin Sorrell anounced recently that they need to align media with data more, it was a bit of a "duh, thanks for the insight from five years ago." John Grono from GAP Research, March 2, 2018 at 7:16 p.m. Thanks goodness that digital ad dollars correlate with e-commerce, otherwise what would be the point. 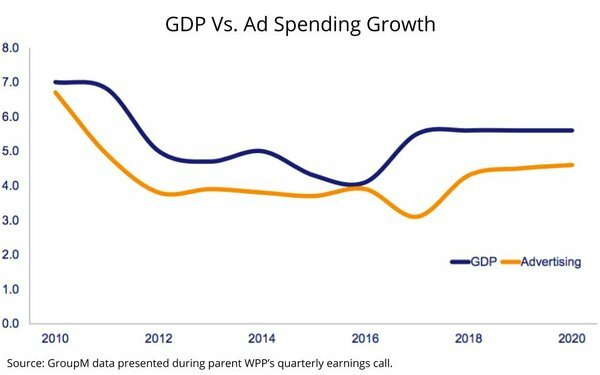 And thank goodness that the growth in adspend correlates with the growth in GDP. But I can't see the piece that is "teasing out growth of e-commerce relative to overall ad spend". And I think that "the GDP growth relative to ad spend" has been happening for most of the last century .. meaning that the dawn of the new age has been happening for yonks. If it showed a correlation between GDP growth and digital ad spend then there is the possibility of evidence of a 'new age'. The caveat being that correlation should never be confused with causation. But I am just glad that you are happy Chris. Chris Peterson from R2C Group replied, March 2, 2018 at 7:25 p.m.
Having a bad day John? Enjoy your weekend. No way Chris. It's a beautiful day here in paradise where I live.